ST. THOMAS, USVI (CBS USVI) – Voters fired up over a mid-game change to requirements in the Virgin Islands. “You have these thousands of ballots coming in and you don’t know at midstream if everybody actually counts,” Harriet Mercer, a Board of Elections Member said. Harriet Mercer currently serves on the board of elections and said when she found out a photo ID was no longer required for early voting, she said she couldn’t believe it. “The law calls for the showing of IDs,” Mercer added. Mercer and others met outside the Election System Monday to show their disapproval of the move and called on election officials to require the photo. 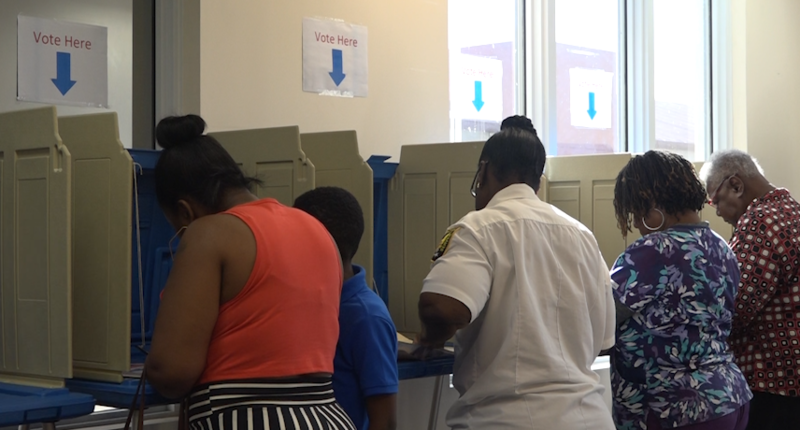 While voters outside are concerned about how the process is going, inside the Election System they told CBS USVI they are being transparent and sticking to the law. “The folks in the VI have been stating you need photo ID but that’s not the law,” Caroline Fawkes, Elections Supervisor at the Election System of the Virgin Islands said. Fawkes said VI law section 582 said a voter can state his name and present a certification of registration to his election officers. If they are satisfied with his paper work, he is allowed to vote. Fawkes walked CBS USVI through this process. She said voters fill out one an application. It is a form filled out by voters prior to receiving their ballot. Then it is brought back to the team. One of five members have the authority to authorize the application. Then they check to make sure the person is a registered voter. Fawkes said the application to vote, clearly states the penalties for attempting voter fraud. She said with so many losing their voter cards in last years’ storms, all they need is the date of birth and name to make sure those voters don’t miss out. “This application is not done before they reach our office and everything is cross checked here in our office,” Fawkes added. Voting without ID was put in place October 19th. Early voting ended the 30th. This process will be in place for Election Day. Monday – Friday: 6 p.m., 7 p.m., 11 p.m.
Tuesday – Friday: 6:30 a.m., 12 p.m.